LOUISVILLE – For the first time, translation services are being offered as part of the plenary session and worship services at the Presbyterian Church (U.S.A.) Big Tent event. The churchwide gathering is July 6–8 on the campus of Washington University in St. Louis. The event has selected software provider TheoTech to provide translation services via its spf.io — pronounced “spiffy-oh” — online application that delivers real-time captions and translations of events to projector screens and mobile devices. Spanish, Korean and English subtitles will be offered to all Big Tent attendees via this new application. Unique to spf.io is the ability to not only display text of prepared content, such as song lyrics and presentation slides, but also to automatically translate the spoken word — as subtitle text or speech interpretation — in real time into more than 50 languages. TheoTech was founded by Chris Lim, a ruling elder at the Indonesian Presbyterian Church in Seattle, and his sister Natasha Lim, both former employees of Amazon. One of the company’s first products was “Ceaseless,” an application that gathers a user’s contacts and sends reminders to pray for them. The dedication to “customer obsession” — infused into the culture at Amazon — plays a significant part in the company’s direction. God, they say, is their customer. And for them, pleasing God means making the message of the gospel more accessible. Inspired by the text of Revelation 7, where the people heard the message in every language, Chris Lim said, “If that’s what God’s vision is for [the] kingdom, then we want to see how do we help churches to reflect or create a foretaste of that kingdom in the present — because that’s what we believe our customer desires. 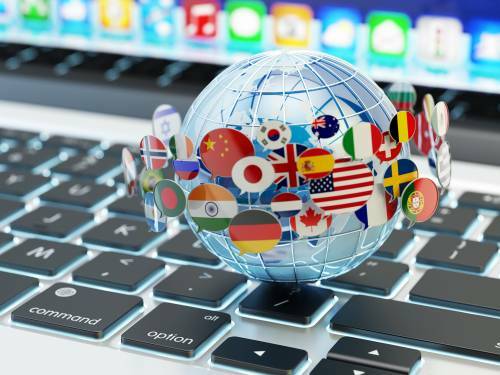 “We recognize technology is a way we can lower the language barrier, which is one of the main reasons it’s so challenging [for multilingual congregations] to be together and worship in many languages,” he said. Lim’s own experience as a second-generation Chinese-Indonesian person in an Indonesian-language church was also an inspiration for the application. When the church branched out to offer an English-language service, he said it essentially created two congregations, each speaking their own language. He hopes spf.io can alleviate such divisions in the future. Spf.io uses artificial intelligence technology and the latest tools from Google Translate and Microsoft Translate to process written and spoken communications, learning new idioms and voices along the way, making the experience for those needing translation “as simple as coming to the service and taking out their smartphone, pointing it to a [web address] — it’s going to be bigtent.spf.io for Big Tent,” Lim said. The benefit, Lim said, extends to visual- and hearing-impaired people because of the dual nature of written and spoken translation occurring simultaneously in real time. Saying it was a linguistic disadvantage to be part of an Indonesian-speaking church in a majority English-speaking presbytery, Lim hopes spf.io can bridge that divide as well, inviting non-English-speaking leaders to play a larger role in the life of the church. More Big Tent information and a registration link can be found at pcusa.org/bigtent.